This is my daughter Autymn as a scuba diver for her second Halloween. I came up with the idea because she has a trach and is on oxygen. We ended up not being able to use her real oxyen tank because it was too heavy on her so we painted a 1 liter soda bottle and attached a black hose to her snorkel..lol.. I took an old red wagon and painted it blue and added fish and shark stickers to make it look like she was in the water. 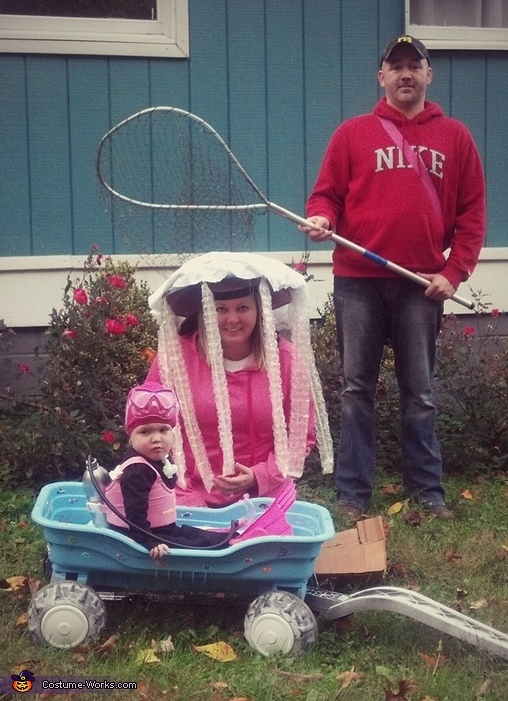 I dressed as a jellyfish...I used an umbrella hat, bubble wrap and glow sticks...Daddy was the first mate saving the baby from the giant jellyfish...lol...It was a big hit! !